You can take a look at Facebook, Check-a-trade and Google for more customer feedback too. Received an excellent service from Awningsouth from quotation to the actual work on the day! We had a large electric patio awning fitted and we are really pleased with it! Look forward to using it when the weather is nice! Would highly recommend Awningsouth to family and friends! 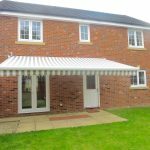 We are delighted with the 2 4.5m awnings installed and the process from the initial chat through the discussion on specification and then the installation was excellent and professional. It was concluded with a follow up visit to check everything was OK and was overall a very good end-to-end experience. Great service from start to finish, had our electric awning fitted within 3 weeks of ordering. The fitters professionalism stood out, the awning was fitted within 3 hours and looks fantastic. Many thanks to your company. We just had to say how happy we are with our new awning from awningsouth. Our new extension with bi-fold doors was recently completed and we didn't want to spoil our view by installing window blinds. We have found that our new awning gives us all the shade and protection that we need. Since we had the awning fitted we have been able to use our new decking area so much more; we spent the entire weekend last week entertaining the family outside and we used the awning both night and day. It's all such a far cry away from the old garden parasol days. Many thanks to your company for guiding us through the whole process. We really will recommend you to all our friends and neighbours. Many thanks for an excellent job. All we now need is some sun to see if it works! 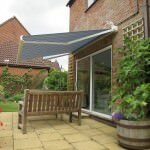 We contacted Awningsouth prior to moving into a new build so that we could select the right awning for our large terrace area in order to obtain expert advice as their website impressed us. 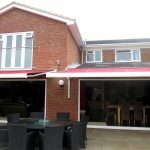 We must say that we were not disappointed as their service and the final product were second to none in our opinion having had awnings installed before on other houses/villa's. Their advisory service, selection process, installation process and warranty period were all very impressive. The company communicated well with us in a responsive manner, were very reliable and with all our many questions both over the phone and onsite at our new property they were handled in a very competent and professional manner. 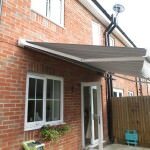 They set the correct expectations and proved to be good value for money, with us now enjoying the high quality awning and previously excellent service. We would recommend them to others and would definitely use them again". Your team have done a brilliant job. Thank you once again. We had our awning fitted this morning and we are very pleased with your team's work and helpfulness during the fixing.